Our biggest and best festival line-up yet, with new acts aplenty and some old favourites too. Bythams Music is delighted to announce the performers for the 2018 festival. This year, reflecting the Midsummer Festival’s overall Country Capers theme, there’s a distinctly folky, bluesy, country, rootsy flavour to the weekend’s musical mix. But we also have some exciting young indie bands, some alternative rock and prog rock, covers bands, Americana, Motown and funk, a fantastic gospel choir and much more. Truly something for everyone! The Music Festival takes place on St Martin’s Field, Castle Bytham. Free Admission & Free Parking in adjoining fields (aim your satnav for NG33 4SB). Please don’t try to park in the village, where there will be lots of other events happening: see Castle Bytham Midsummer Festival website. Visitors with limited mobility can be dropped off outside the Castle Inn. This year we plan to keep the music going as continuously as possible on both our stages. NB © Copyright of all artists’ photos is retained by the band, artist or the original photographer. Still only 13, Stamford singer-songwriter Chloe’s already won songwriting awards, headlined her own sold-out concert, and released a CD that’s raised thousands of pounds for War Child UK. She’s accompanied by pianist Jake Piechota (15) from Peterborough. Despite Chloe being the youngest ever competitor in the Twisted Melon Acoustic Battle of the Bands, they won and will now perform on the BBC Introducing Stage at Europe’s biggest free festival, Festival Too in King’s Lynn. Paul has been playing acoustic guitar for nearly half a century, incorporating his skills in his career as an actor and teacher. His delicate fingerpicking style – influenced by such heroes as Ralph McTell and Dougie Maclean – can be heard in a variety of venues in and around Rutland (most of which sell beer). A veteran of the British blues rock scene of the late 60s and 70s and onwards, Brian Harris came back to the stage in 2016 with the resurgence of interest in blues rock across Britain and Europe. He is joined by Pat Martin, previously known from Laughton’s Last Stand, and Dan Stimpson, also known for his placements in the bands Lucks Lane, Last Minute Brigade etc. Based in Fulbeck, Lincolnshire, North End was founded in November 2016, playing an eclectic range of toe-tapping, upbeat, fun music ranging from ZZ Top to Chuck Berry. “Our five-piece band, currently performing at a range of local venues, consists of vocals, lead guitar, rhythm guitar, bass guitar, harmonica and drums. We have just launched our first CD which will be on sale over the weekend. You can follow us on Facebook. A singer-songwriter with an incredible voice and a large collection of songs, Rebecca has just been signed and has released her debut EP with plans to release her LP before the end of the year. She’s booked to appear all over the summer before heading into the studio. Jon Rogers: vocals/guitars, Paul Mallatratt: bass and Nigel Lobley: drums. Promoting their debut album ‘Ideology’ and performing new material, an eclectic mix of influences across genres: rock and blues with a little prog styling where required. The trio bring together career highlights including: recording with legendary producer Gordon Raphael (The Strokes); performing with Dale Storr, Danny Bryant, Dom Pipkin (Paloma Faith) and the legendary Memphis Horns; working alongside Van Morrison, Junior Wells, Robert Cray, Peter Green and Ruby Turner. Introspective and emotional singer-songwriter Will Purdue and alternative multi-instrumentalist Liza Bec continue their collaboration, showcasing evolving and exciting new material from their latest releases. Will’s soulful Cohen-esque baritone and Liza’s pure soprano combine in a truly unique combination of sultry harmonies, with Liza adding both recorder and saxophone to Will’s skilful and sensitive guitar. Together they create a very classic and rarely heard sound, fusing elements of folk storytelling with alternative rock. I ndie rockers Don’t Forget Rupert come at you with catchy hooks and feel good vibes that nod towards Panic! at the Disco and The 1975; the result is distinctly contagious and altogether captivating! The world’s only Anglo-Latvian Zydecajun ceilidh band have been playing together for 30 years and during that time they have become well known throughout the UK playing a mixture of English, Latvian, Cajun and American roots music. Janis, Bob, Dace, Jo and Robin play a vast array of instruments, including fiddle, guitar, concertina, melodeon, percussion, clarinet, tenor and soprano saxophone, and above all piano accordion. Their musical heritage emerges from the Baltic shores of Latvia, flies over the wild hills of Wannie, meanders through the quiet lanes of Northamptonshire and is absorbed into the steamy bayous of Louisiana. An original celtic folk band with six critically acclaimed albums, published works with Cherry Red Records and over 2,000 live performances, including gigs from the smallest of venues to outdoor arenas and, most notably, their own show at The London Palladium. NB © Copyright of all artists’ photos is retained by the band or the original photographer. Bythams School children will sing three songs, including one original composition. The Dance Academy holds classes in ballet, tap, modern, street jazz, musical theatre and acrobatics, for 3-year-olds to adults. Jane Brown: 07979 613826. Lively and energetic, inspired by classic blues, rock and folk/singer-songwriters, after being selected as BBC Introducing Artist of the Month for Coventry/Warwickshire, Pembroke quit his boring desk job to go into professional musicianship and songwriting. His powerful singing voice and rhythmic guitar work blend fierce rock and blues with thoughtful lyrical folk songs. He followed his debut album, Chimera, with his 2016 EP, Gravity. The 1960s saw the pop/folk sound emerge with acts such as The Springfields, The Seekers and UK quartet The Settlers, who enjoyed chart success with The Lightning Tree (theme music to TV’s Follyfoot Farm)… In 1975, after major success of their own, Steve and Patty joined The Settlers until the early 80s when they disbanded. A lively, original singer- songwriter known for entertaining performances, Brian Stone (The Pirate) has that magical ability to engage with audiences. Jonny Wallis (The Fox) has a reputation as one of the finest voices in folk-rock with original songs sung from the heart. Together the Midlands duo are greater than the sum of the parts, their energy and enthusiasm making a riotous cocktail. A four-piece indie-folk band from the East Midlands. On Sunday, Bythams Music and the Midsummer Festival combine to bring you a fantastic array of street entertainers, from jugglers to fire-eaters, street theatre to stilt-walkers, archery and more, plus morris and molly dancers, throughout the day. And look out for details of music in the pubs and perhaps other venues too! On Saturday and Sunday this year our amazing Beer Festival features 24 real ales, 7 lagers and 10 ciders, plus on Sunday we will also have a Prosecco Bar and a Pimms Tent! The excellent food options include our perennially popular barbecue and the Village Veggie stall. 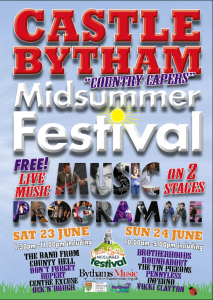 The music and entertainment programme for Castle Bytham Midsummer Festival 2018 is supported by South Kesteven District Council. PRS for Music licences the use of copyright music across the UK, giving businesses and organisations the legal permission they need to play the music they want. These licences ensure that music publishers, songwriters and composers are fairly rewarded with royalties so they can keep making music – and mean that we’re able to support music at events like this. For more information, visit www.prsformusic.com or call 0800 068 4828.